A new portrait offers a glimpse of how the historic Fry’s Sentinel shunter used to look – and how it will look again once it has been returned to its former glory. The painting by local artist Alan Ward is on sale, with proceeds going towards the restoration of the locomotive being carried out by volunteers at Avon Valley Railway. 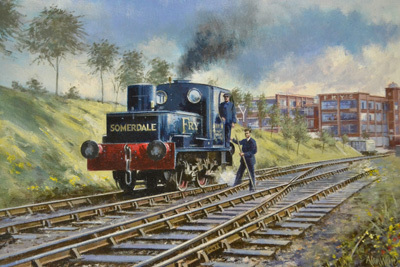 In the portrait the locomotive is resplendent in its royal blue livery with steam billowing as it makes its way along the tracks at the Fry’s factory at Somerdale, where from 1928 it was a familiar sight. The 85-year-old Sentinel shunter was retired from the chocolate factory in 1956, where it moved trucks and wagons along the site’s two-mile track. The painting was commissioned by volunteer George Colbourne and limited edition fine art prints are now for sale. Each will be numbered and signed by the artist and are available in sizes 20” x 16” at £35 and 12” x 10” at £17.50. Anyone who wishes to purchase a print can contact Mr Colbourne on 0117 986 2858 with their order.